Our daughter, Chloe, had cancer a few years ago and came through it with flying colors and is wholly healthy now. I decided to make a gratitude offering in thanks for her beautiful recovery and healing. So, I decided that I would do a very simple thing that would be of service to people who need wigs while they are getting treatment. for a couple of years, until it was just above my waist. It hasn’t looked like this since the day of the haircut, because I have no ability to use a dryer or curling iron, and miraculously, my hair that has always been straight as a ruler, has decided to be full of wild and unruly waves and curls. I am astonished. All my life, I have wanted curls or at least waves, and now I suddenly have them and don’t know what to do with them. That’s the big fat braid going to the Cross Cancer Clinic in Edmonton Alberta. The Cross Clinic asks people to bring their hair donations directly to them, as they have specific wig makers that they prefer to use. They were pleased with the great big fat long braid of hair that I brought them and I was so happy to make this donation. May it bring some measure of happiness to the person who gets the wig with my hair in it. If you find it easy to grow your hair, then perhaps you might consider doing a donation too? Our daughter in law, Alliston, has done the same thing, also in gratitude for Chloe’s fantastic outcome, and she is now sporting a very spiffy and short new hairdo, too. It was very emotional, and I am very happy to have done it. My dearest friend is going through some health issues, and so I have woven her a prayer shawl. 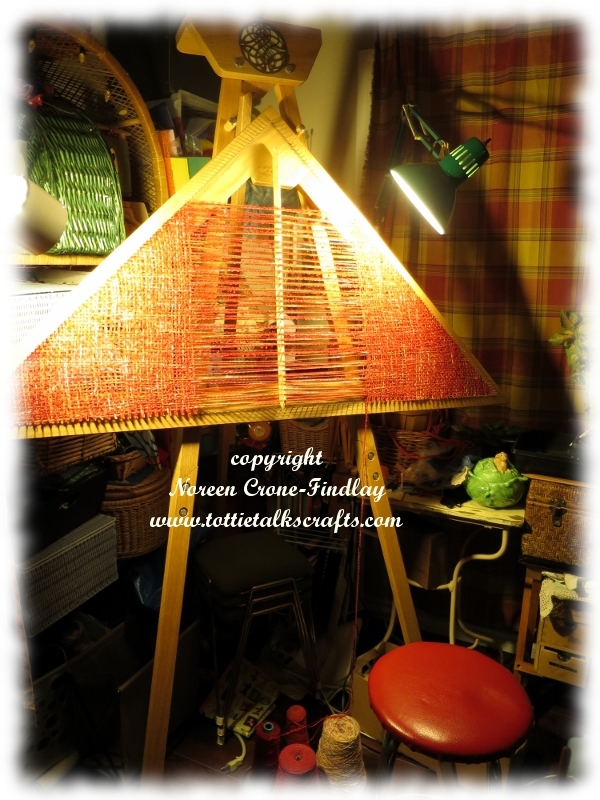 I like to work with the loom pointed up- it feels most stable that way on the easel, and I like having the widest edge being the foundation of the weaving. 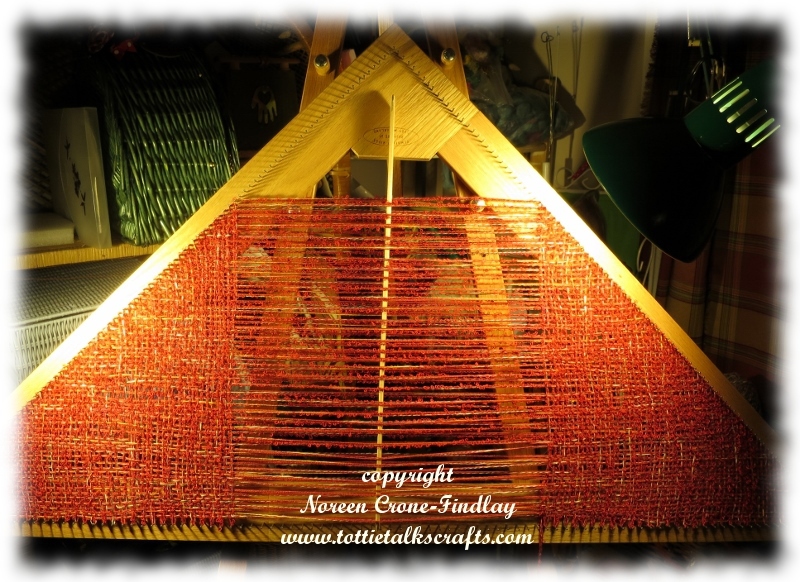 I use a shed stick to do the weaving and then scoop the weft yarn through with a crochet hook. 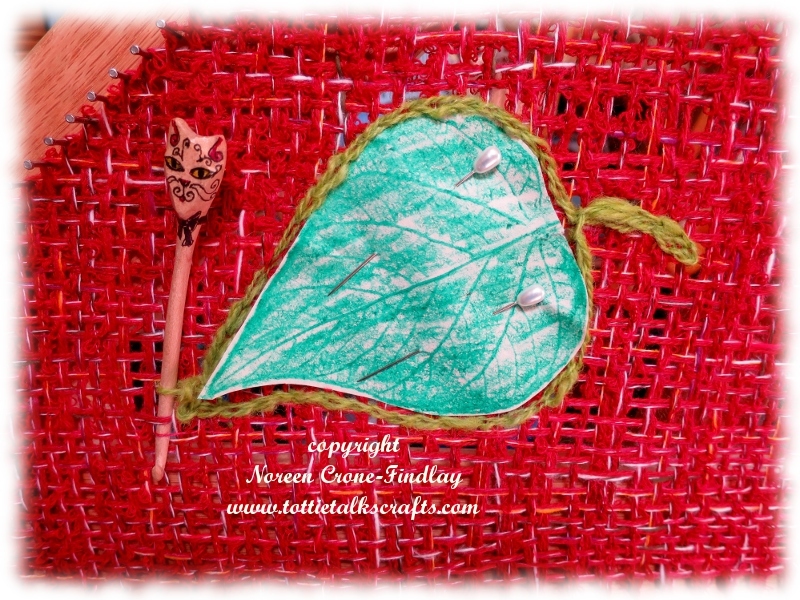 I brought in sunflower leaves and large tree leaves, then made rubbings of them on paper with crayon. 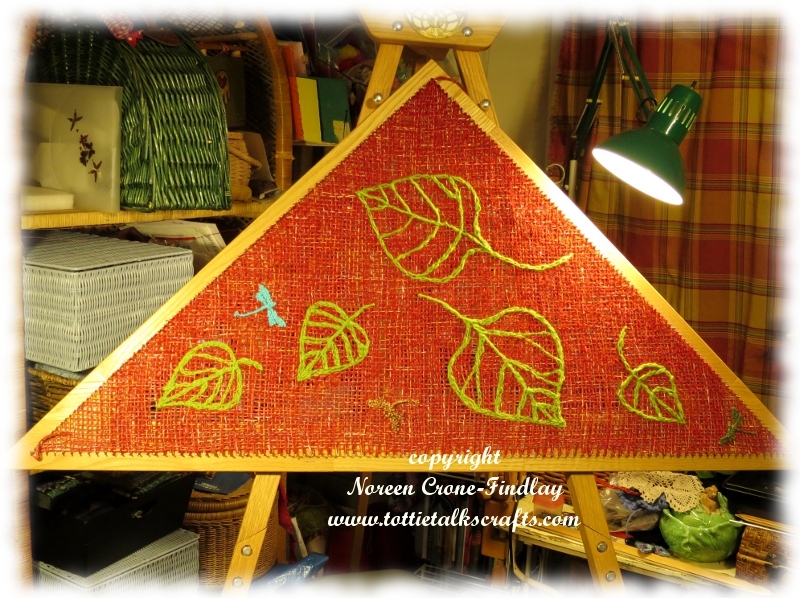 Then I used the Tambour technique (see LINK for video tutorial) to work the leaves onto the triangle. 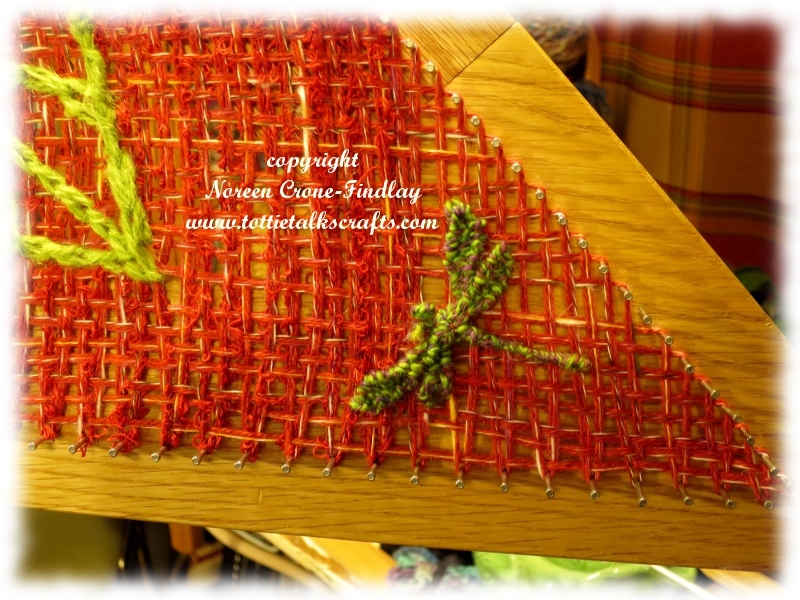 I wove dragonflies on my Dragonfly Loom (LINK) and stitched them on, as she loves dragonflies. 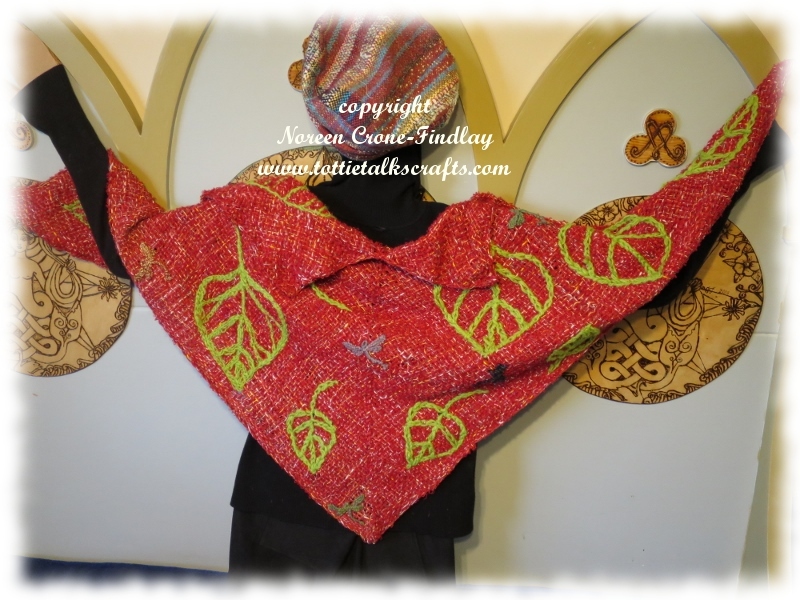 Dragonflies are such a powerful symbol of renewal that they are perfect on a prayer shawl. 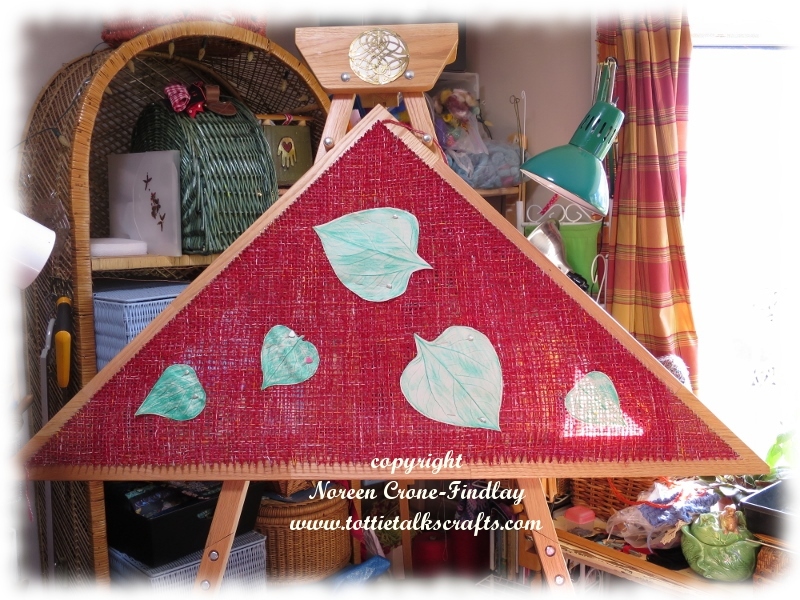 I used the 4 foot configuration, and wove and embellished 2 triangles. 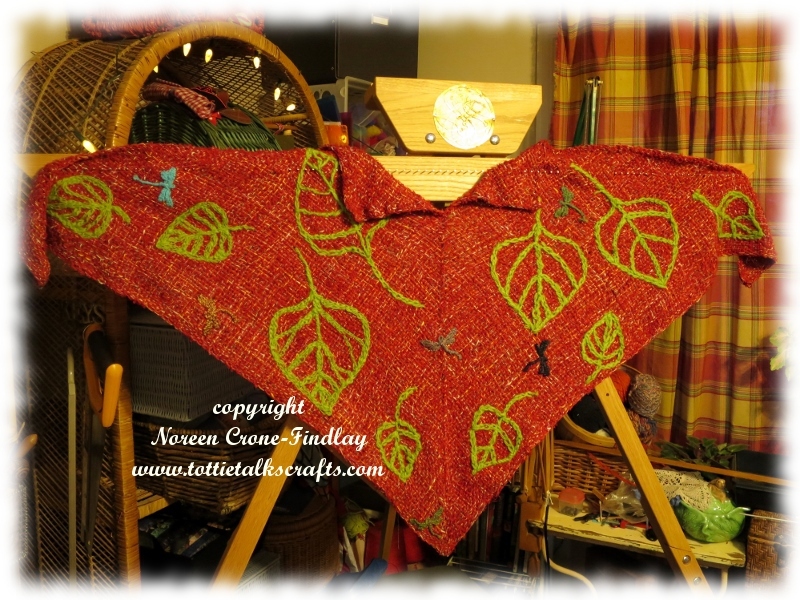 I did the tambour crochet and appliqueing of the dragonflies while each triangle was still on the loom. The leaves are handspun wool spun by my daughter-in-love, Alliston Findlay. I used a combination of weaving threads, including cotton boucle and merino, to create a light and airy shawl that she’ll be able to wrap around her shoulders and have with her on her healing journey.